Curious about what’s been happening next to Alexander Elementary on Beverley Street? Well it’s the Cowichan Green Community’s newest food security project: the Cowichan Incubator Seed Farm. Emulating the successful Incubator Farm model that has been adopted across Canada to educate, train and ‘incubate’ emerging new farmers, this project will focus specifically on training a new generation of seed farmers. The Cowichan Valley’s mild climate, dry summers, and productive soil once hosted many successful seed farms that sold across Canada and the UK. The increasing de-regionalisation of agricultural production over the last half century spelled the demise of our local seed companies, and with it our region’s seed security. Without a local supply of resilient, adapted, and open-source seed, our community’s food security is at risk. 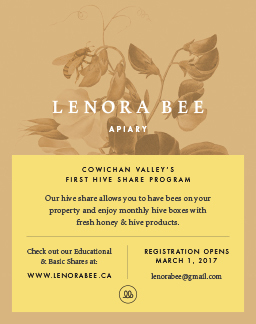 With the support of the Municipality of North Cowichan in the form of a generous lease on the 3 acre property, the Cowichan Green Community is thrilled to be spearheading this initiative. Although we’re in the site development stage this year (feedback and ideas from the community are much appreciated!) we hope to have seed farmers-in-training starting in the Spring of 2017. These aspiring farmers will undergo a year of education and training in the basics of organic farming and seed production. The result will be skilled seed producers ready to contribute to our local seed capacity. In addition, the farm will serve the region as a hub for seed education, hosting workshops, field days, and seminars on the many aspects of seed saving and production. From the smallest allotment grower to commercial farmers, there’ll be something there for everyone. We welcome any questions and contributions you may have regarding the farm and its goals. Don’t hesitate to contact the Cowichan Green Community, or stop in at the farm if you see us out there! Foster Richardson is a farmer, seed saver, and coordinator for the Cowichan Incubator Seed Farm.